Do NOT choose more than THREE day delivery unless the order is larger than 15 pounds. 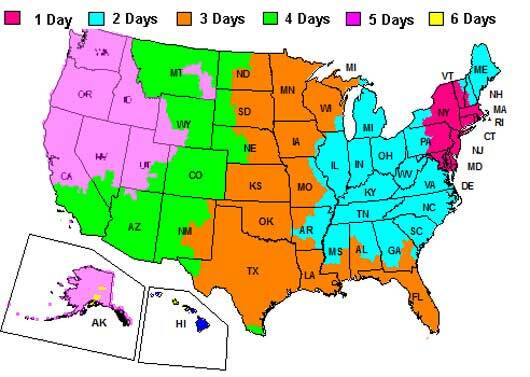 FED EX GROUND/HOME DELIVERY Map from New Jersey. US Postal Service Priority Mail orders are shipped Monday through Wednesday and some Saturdays. Your package mailed on Saturday is in transit on Sunday. The Postal Service moves mail 365 days a year- they do not warehouse packages over a weekend.